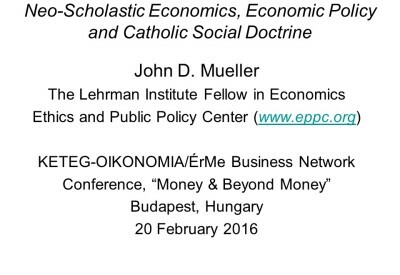 This presentation was delivered at a conference in Budapest, Hungary, titled “Money and Beyond Money,” organized by the KETEG-Oikonomia Research Institute and Foundation and ÉrMe Business Network. 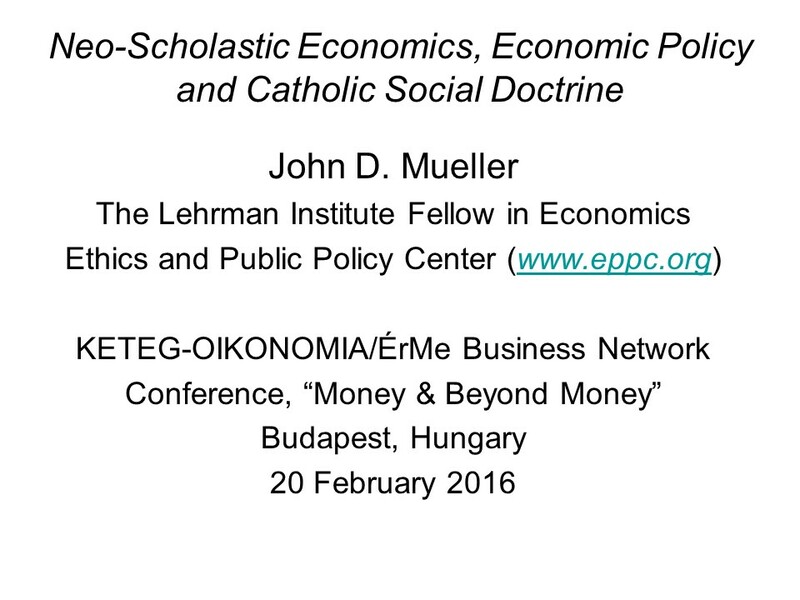 My thanks to KETEG (Christian Social Principles in Economy), especially to Sr. Laura Baritz and Gergely Dabóczi, and to József Tóth of the ÉrMe Business Network for organizing this rich and timely conference, as well as the conference’s sponsors and patrons, including MKB Bank, the Government Debt Management Agency, the Hungarian National Bank and Corvinus University. In my remarks I’d like to accomplish three things. First I’d like to explain how the original Scholastic Economics differed from both Adam Smith’s later Classical economic theory and today’s Neo-Classical Economics, which succeeded it starting in the 1870s; second, how an updated version, “Neo-Scholastic Economics,” is already reshaping our understanding of secular economic theory and offering new policy solutions; and finally, how Scholastic Economics provided the analytical “toolkit” for the much younger body of Catholic social doctrine. What, according to Mueller, is wrong with economics? In the simplest terms familiar to economists, there is an “equation” missing from the model. Economists have “equations” for production, consumption, and exchange, but not for the primary economic choice – the choices of persons. This missing element is a theory of distribution. Mueller argues that Thomas Aquinas had a complete economic model, with all four elements. 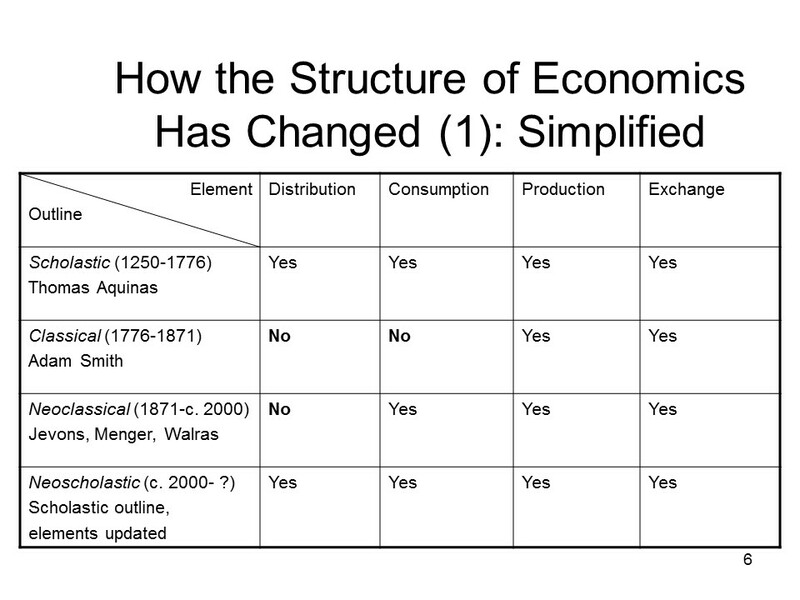 Drawing on Aristotle and Augustine, Aquinas’s economics explained production (what is produced and how), consumption (utility), exchange (commutative justice), and distribution (production or purchase for whom). Adam Smith, the father of modern (classical) economics, dropped two of the four equations, those for consumption and distribution. With neoclassical economics the equation for consumption was restored. 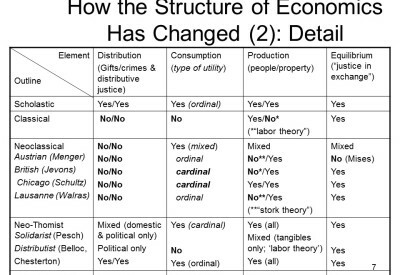 But neoclassical theory has nothing to say about distribution, leaving the restoration of economics incomplete. Mueller sees this reconstruction (redemption) continuing with his book, with the efforts of other nascent neo-Scholastics and, he predicts, eventually by the profession at large. Thus Mueller himself does not think his book will be ignored. Or perhaps, if it is ignored the deficiency of economics will become evident to practitioners from their experiences doing economics. Mueller expects that economists will find their way to a neo-Scholastic economics that will preserve the best of both Smith and the neoclassicals, while restoring the theory of distribution. (Hammond 2012, 73). Mine is indeed the latter view: that “the deficiency of economics will become evident to practitioners from their experiences doing economics” so that “economists will find their way to a neo-Scholastic economics that will preserve the best of both Smith and the neoclassicals, while restoring the theory of distribution.” The technical problem is that with fewer equations than variables to be explained, the classical and neoclassical systems are “underdetermined,” thus requiring economists to adopt circular logic or empirically false assumptions (or both). I realized this by the accident of becoming an economic and financial market forecaster, which requires spelling everything out mathematically and verifiably. But in terms that most ordinary people can understand, the scholastic, classical, and neoclassical systems presuppose three different views of human and divine nature, differing on whether man and God have free will. 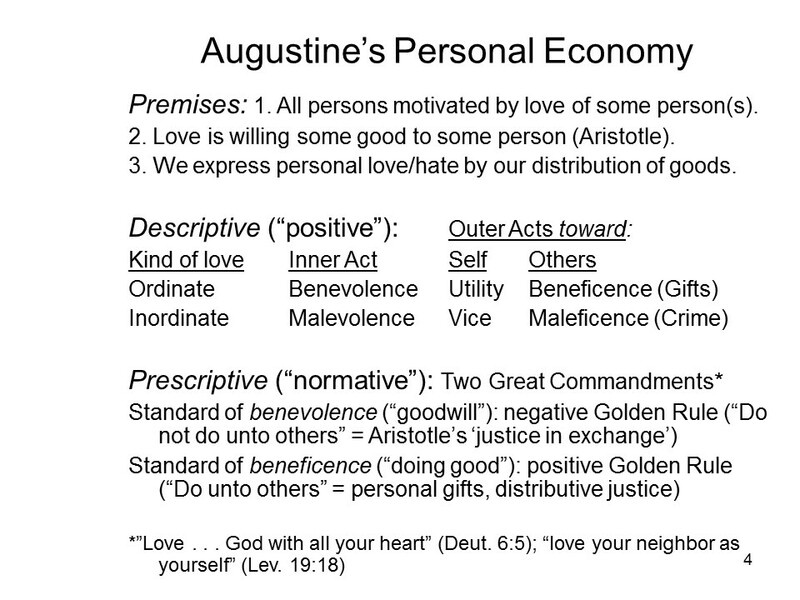 Scholastic economics (1250-1776) might be called “AAA” economics because it began when Aquinas first integrated four elements (production, exchange, distribution and consumption), all drawn from Aristotle and Augustine, to describe personal, domestic and political economy within scholastic natural law—all normatively measured by the Two Great Commandments: “You shall love God with all your heart” and “You shall love your neighbor as yourself.” The scholastic economic system is comprehensive, logically complete, can be stated mathematically and (suitably updated) is empirically verifiable. 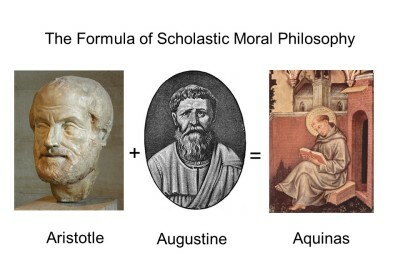 Since Adam Smith essentially “de-Augustinized” economics, it’s important to understand Augustine’s theories of benevolence and beneficence, which Aquinas integrated within the scholastic natural law moral philosophy and economic theory, which prevailed for five centuries before Smith. Augustine’s anthropology and theology had both started from Aristotle’s insight that “every agent acts for an end” and Aristotle’s definition of love—willing some good to some person. But Augustine drew an insight that Aristotle had not: every person always acts for the sake of some person(s). For example, when I say, “I love vanilla ice cream,” I really mean that I love myself and use (consume) vanilla ice cream to express that love (and in preference, say, to strawberry ice cream or Brussels sprouts, which order reflects my separate scale of utility). So Augustine’s crucial insight is that we humans always act on not one but two scales of preference—one for persons as ends, and the other for other things as means: the scales of personal love and utility, respectively. And we express our preferences for persons with two kinds of external acts, “sale or gift.” Generally speaking, we give our wealth without compensation to people we particularly love, and sell it to people we don’t, in order to provide for those we do love. Since it’s always possible to avoid depriving others of their own goods, this is the bare minimum of love expressed as benevolence or goodwill, the measure of what Aristotle called “justice in exchange.” But our positive self-love is expressed by the utility of the goods we provide ourselves, and our positive love of others with beneficence: gifts. Conversely inner hate or malevolence is outwardly expressed by the opposite of a gift: maleficence, or crime: instead of giving to you what belongs to me, I take or destroy what belongs to you. This understanding of economics entails an alternate view of the history of economics; hence my book begins with a “Brief Structural History of Economics,” which describes and distinguishes the scholastic, classical, and neoclassical theories, as well as the incipient “Neoscholastic” school. But the same analysis distinguishes among schools, such as the Austrian, British, Walrasian, Distributist or “neo-Thomist” schools, and even among individual economists. In each chapter, after re-stating and updating the scholastic economic theory, I focus on a salient practical application in which neoclassical and neoscholastic economics reach divergent empirical predictions–for example, at the personal level, disproving the famous claim by economist Steven D. Levitt, featured in his mega-bestseller Freakonomics, that the U.S. Supreme Court’s legalization of abortion in 1973 caused the crime rate to fall 15-20 years later, by eliminating potential criminals (Levitt and Dubner 2005, 117-144). 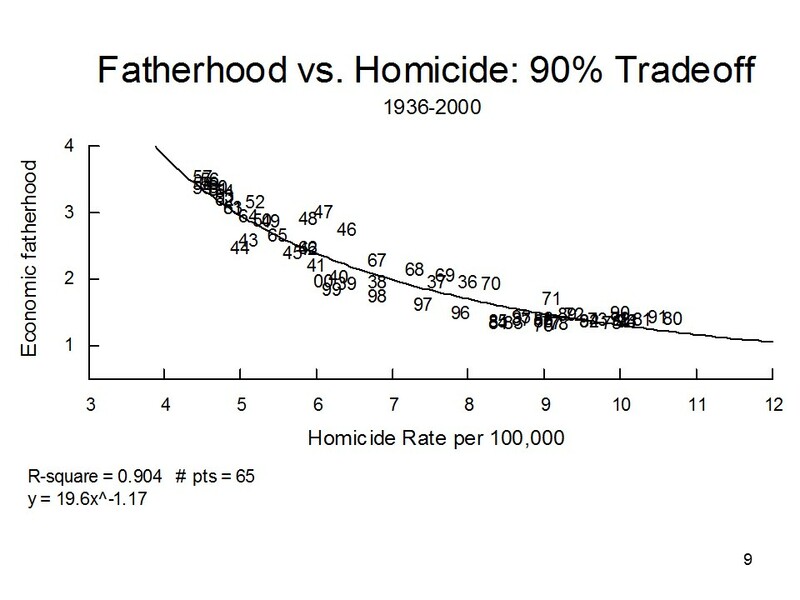 Actually, as I show, there is a 90% current, inverse relation between “economic fatherhood” and homicide. 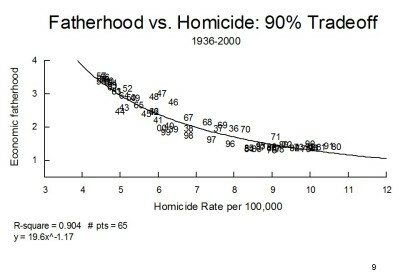 The data show that legalizing abortion raised crime rates both immediately and with a lag. “Neoscholastic” fertility model. Turning to domestic economy, what I call “neoscholastic” economics differs from neoclassical economics by recognizing gifts as well as exchanges. 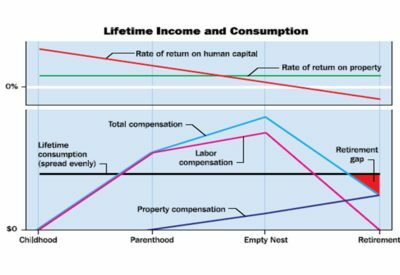 Pervasive gifts are reflected in the systematic differences between income and consumption at each stage of life. 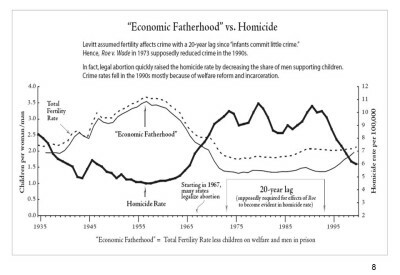 This also makes the “neoscholastic” fertility model much more accurate than existing neoclassical models. Just four factors explain most variation in birth rates among the 70 countries for which sufficient data are available (comprising about one-third of all countries, but more than three-quarters of world population). 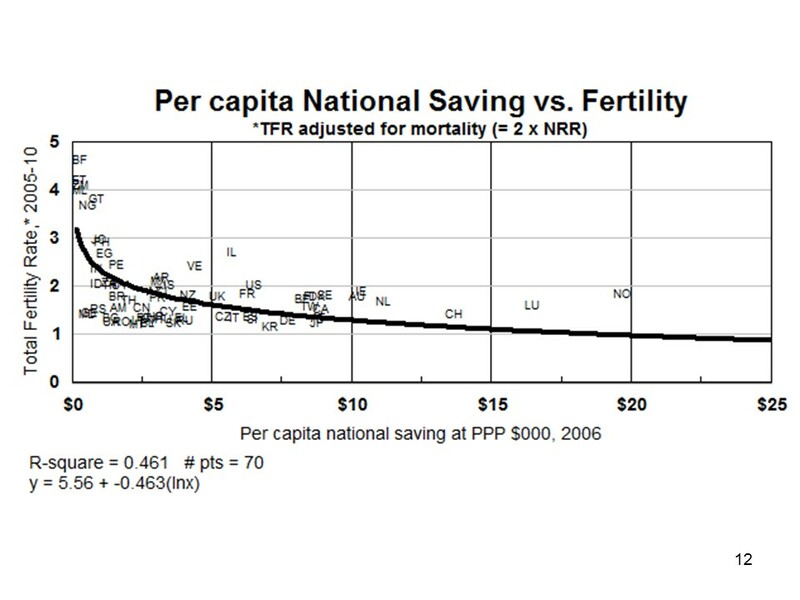 The birth rate is strongly and about equally inversely proportional to per capita social benefits and per capita national saving (both adjusted for differences in purchasing power), which represent provision by current adults for their own well-being. When these factors are taken into account, a legacy of totalitarian government is also highly significant, reducing the birth rate by about 0.6 children per couple. 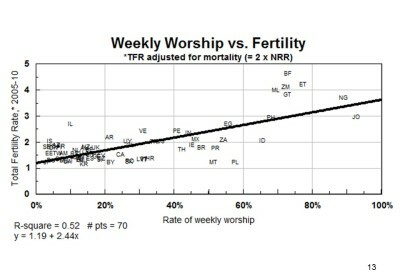 Finally, the birth rate is strongly and positively related to the rate of weekly worship. This is because all gifts of scarce resources—whether rearing a child or worshipping God—require the same lowering of self and raising of others in our scale of preferences for persons. 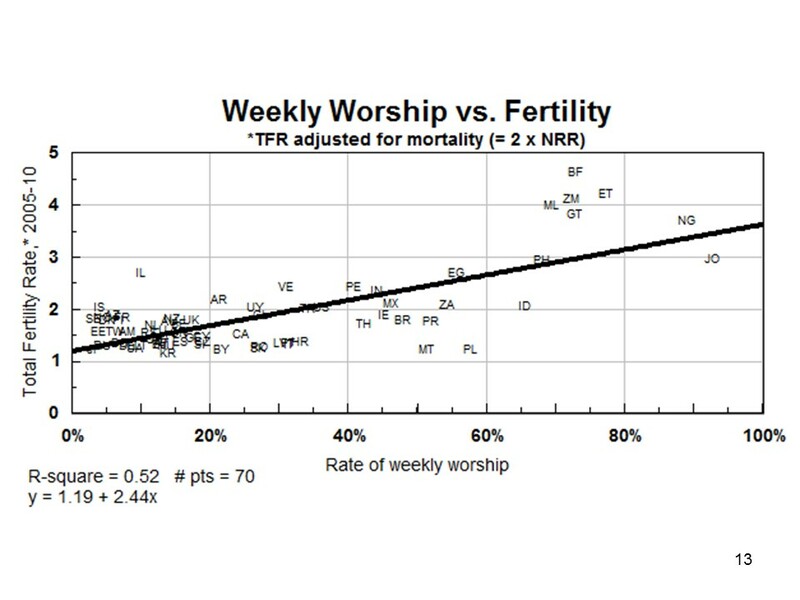 On average throughout the world in 2005-10 (adjusted for differences in mortality), a couple which never worshipped had an average of 1.2 children; but the average couple which worshipped at least once a week had 2.4 more—an average of 3.6 children. Fifty years ago, the world’s three most populous countries were China, India, and the United States. That’s still true today. But the practice of abortion in China but not as widely in India is causing a reversal of their first and second population ranks. 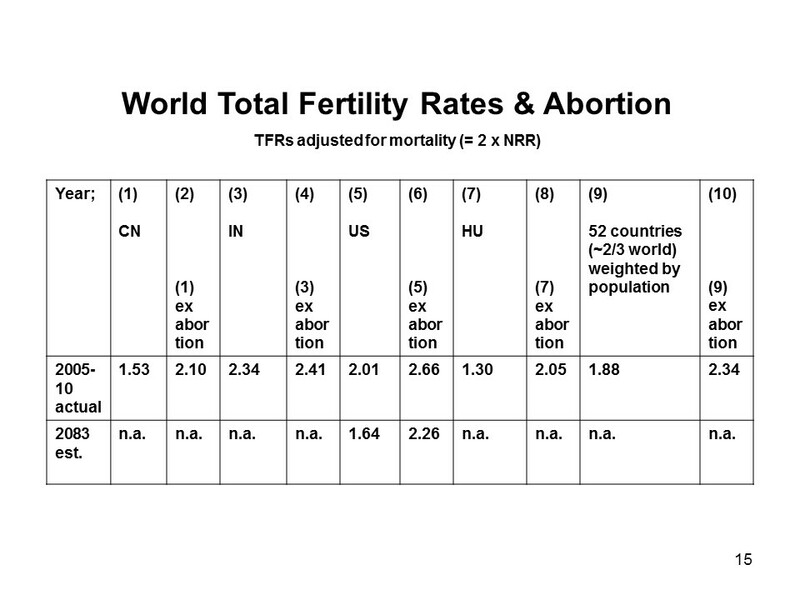 Adjusted for differences in mortality, in 2005-10 China’s TFR was 1.53 after but 2.10 before abortions; India’s 2.34 after and 2.41 before abortions, the USA’s 2.01 after but 2.66 before abortions, and 4th-largest Indonesia’s 2.04 after but 3.05 before abortions. On the same basis Hungary’s morality-adjusted TFR was 2.05—almost exactly the replacement rate—before but 1.30 after legal abortion. 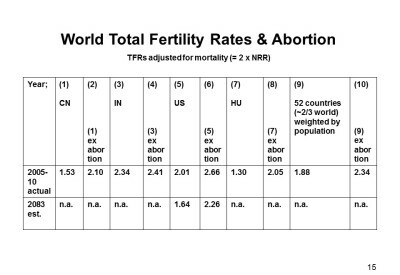 Based on all 53 countries for which data are available (comprising about two-thirds of world population), the World TFR was 1.89 after, but 2.38 before abortions. Thus legal abortion has been single-handedly responsible for “demographic winter” in nearly all individual countries, including the USA and Hungary and for the whole world. Turning now to political economy, I’d like to focus on the two most important modern examples of injustice in exchange, typified by significant unemployment or either inflation or deflation. Both were first correctly diagnosed by the French economist Jacques Rueff (1896-1978), whom I consider the greatest economist of the 20th century. Our conference has used the word “money” as a metaphor for the economic aspect of life. But I’d like to use the term literally. crisis was essentially monetary. Some American officials believe that the dollar’s role as chief official reserve currency has strengthened the United States. As Lewis E. Lehrman and I have shown, the reverse is true. Keynes had argued in his 1913 book, Indian Currency and Finance, that whether a central bank holds its reserves in gold or in foreign exchange “is a matter of comparative indifference,” and that “in her Gold-Exchange Standard, . 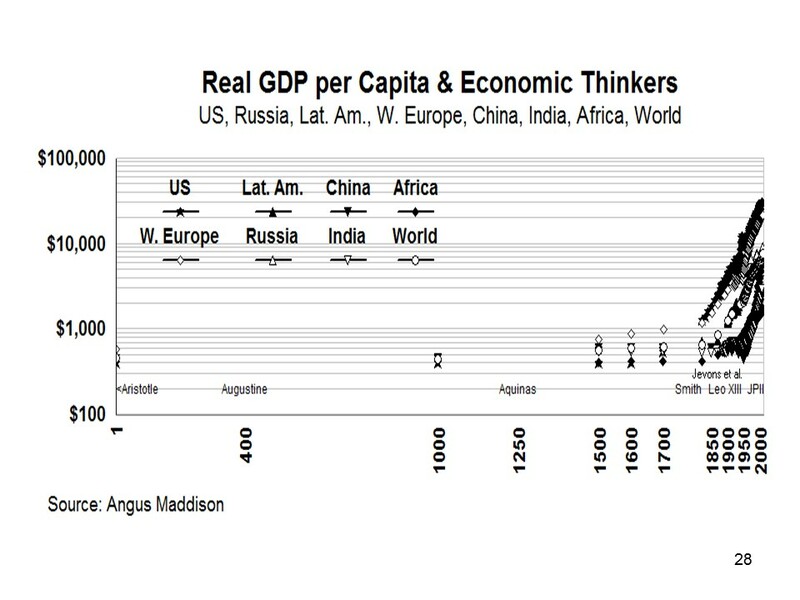 . . India, so far from being anomalous, is in the forefront of monetary progress” heading toward “the ideal currency of the future” (Keynes 1913: 30, 259, 36). Keynes thus foresaw and advocated the coming interwar official reserve currency roles of sterling and the dollar, which he and other British monetary experts convinced the European great powers to adopt at the Genoa Conference in 1922. 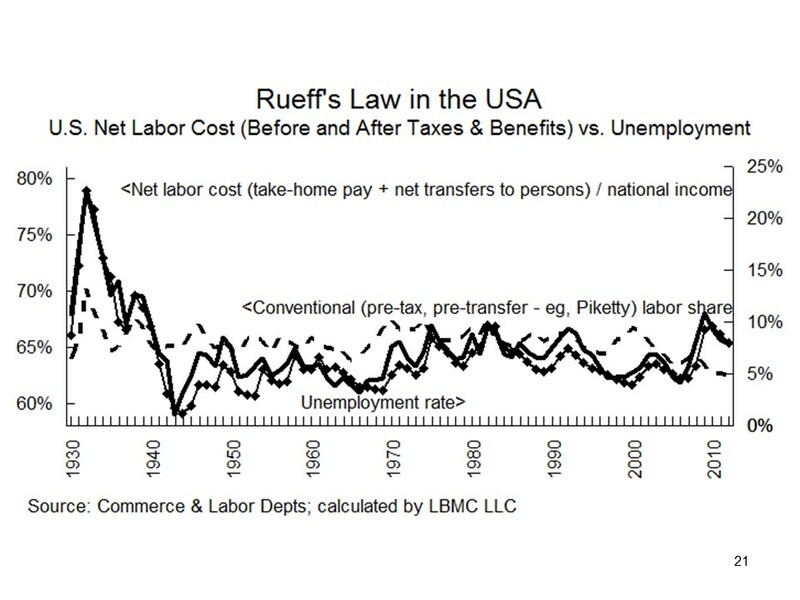 In 1932, Rueff summarized the basic fact contradicting Keynes’ theory and described its role in causing the 1931 financial crisis and Great Depression: When a monetary authority accepts dollar debt for its official reserves, instead of settling balance of payments deficits in gold, purchasing power “has simply been duplicated, and thus [e.g.] 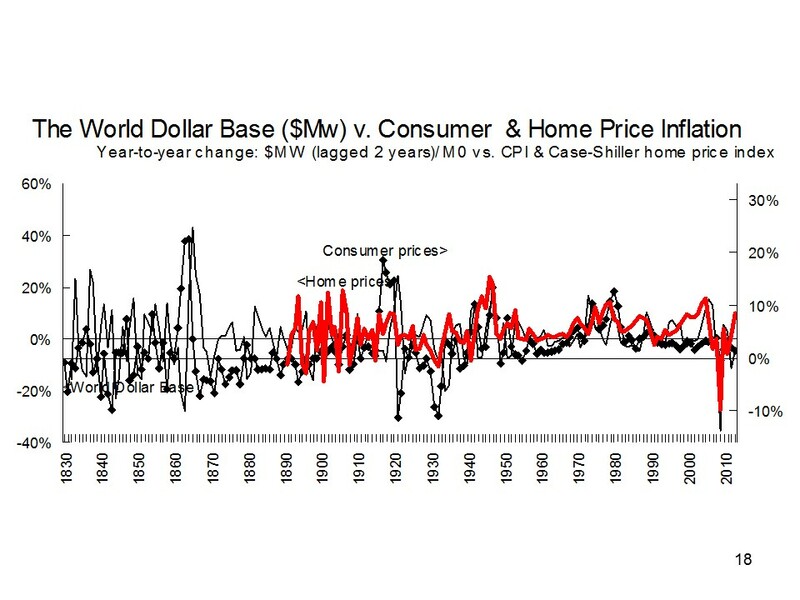 the American market is in a position to buy in Europe, and in the United States, at the same time,” which tends to cause inflation (Rueff 1964 : 52–53). 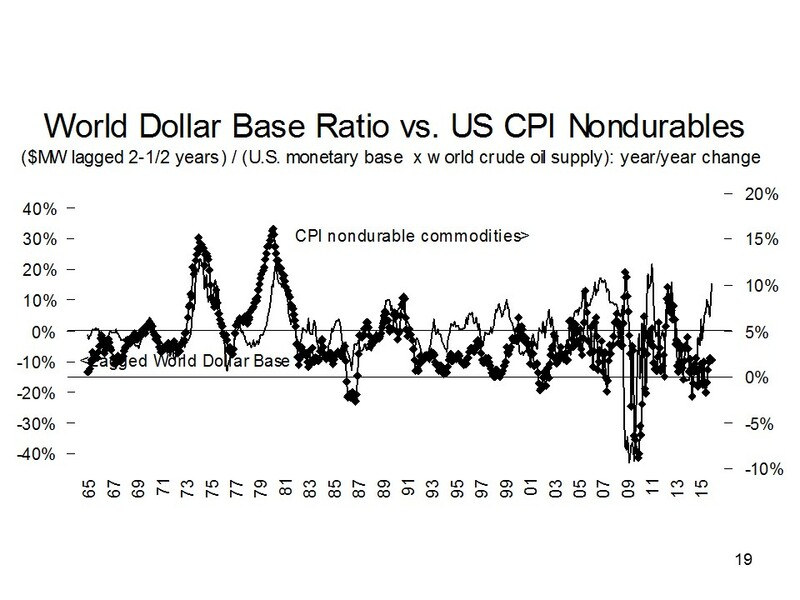 Conversely, the liquidation of official dollar reserves causes deflation. 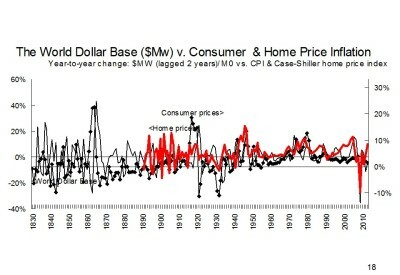 This explains not only the timing and magnitude of the 1920s boom and 1930s bust, but also the demise of the similarly organized post-Second World War Bretton Woods gold-exchange standard, and the monetary expansion that caused a housing bubble and the oil price to spike to $150 a barrel in 2008, triggering the Great Recession of 2007-09. 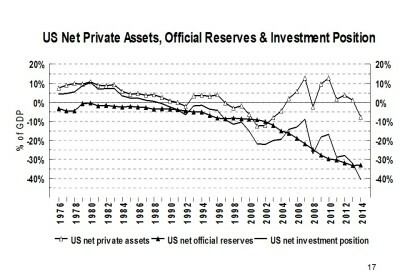 The U.S. international investment position—American investments minus foreign liabilities—has declined almost exactly by the amount of U.S. public debt borrowed from foreign monetary authorities. The same would happen to any other country’s currency which aspired to displace the dollar as pre-eminent official reserve currency, as the dollar displaced the pound sterling. 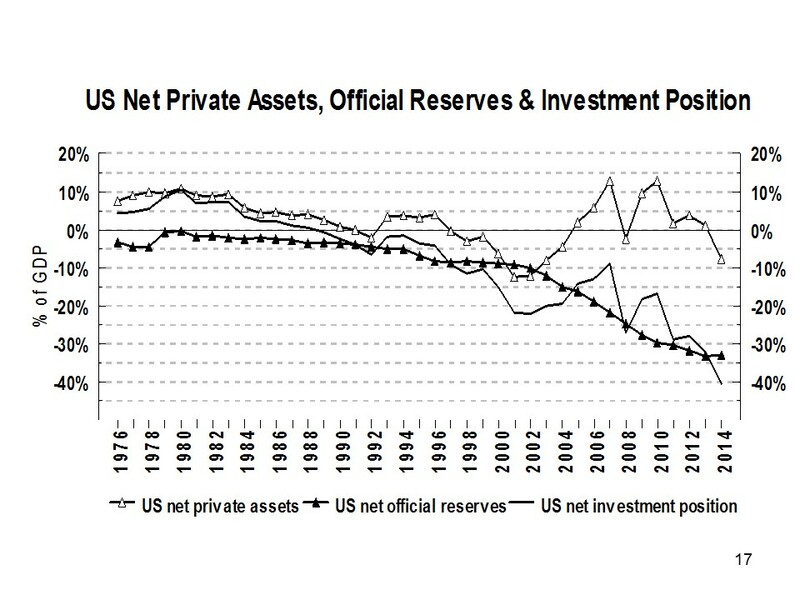 Moreover, the expansion and contraction of foreign official reserves caused the Great Recession of 2007-09 as well as the Great Depression of 1929-32. From 1988 until I retired last year, I was able to make a living as an economic and financial market forecaster, especially in predicting commodity-led inflations which it was possible to predict by applying Rueff’s monetary theory, and by predicting their effects on the stock, bond and currency markets. Therefore, all countries seeking to end the boom-bust cycle, including Hungary, should join in supporting a reform of the international monetary system, which would repay all outstanding dollar and other official reserve currencies and restore prompt settlement of payments in gold: a system that worked well for hundreds of years and can do so again. 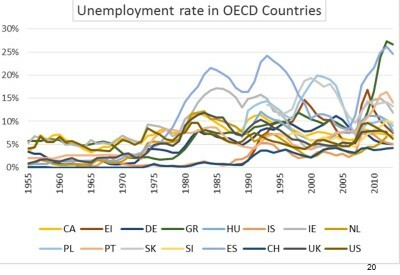 I have just explained that the origin of the Great Recession of 2007-2009 was the same as of the Great Depression of 1932, and why both were world-wide phenomena. 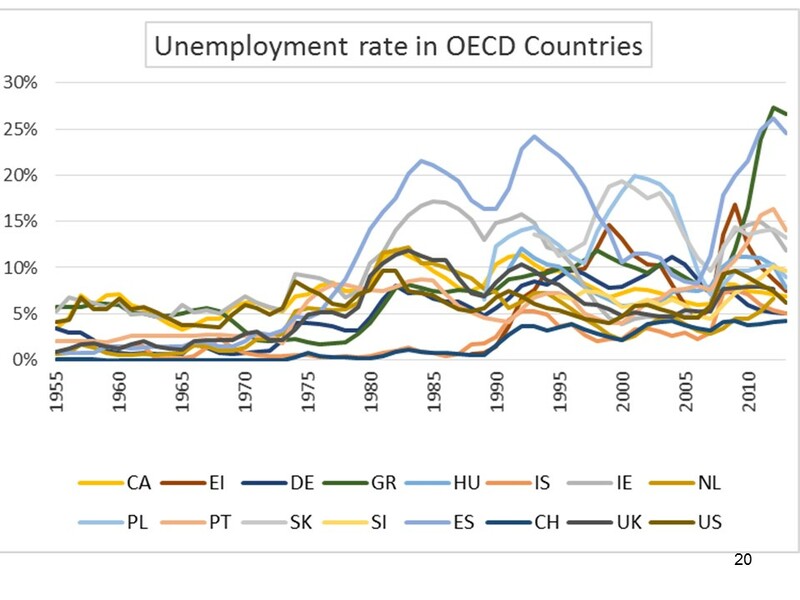 But this does not explain why, during the Great Recession, the unemployment rate varied so enormously by country–peaking at about 4% in Switzerland, 10% in the USA, 11% in Hungary, and more than 25% in Spain and Greece. 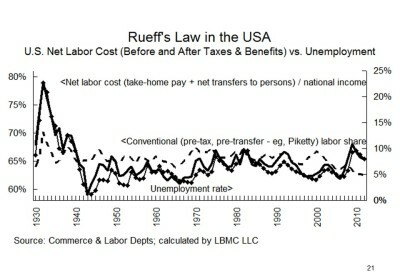 The unemployment rate is determined by what in the 1930s and 1940s was called “Rueff’s Law.” The French economist used it in 1925 to trace Great Britain’s unprecedented post-World War I unemployment to the institution of an open-ended “dole,” fixed in nominal terms (so many shillings a week), in the face of a postwar price deflation, caused by Britain’s return to the pound’s prewar gold value despite a wartime multiplication of the producer price level. 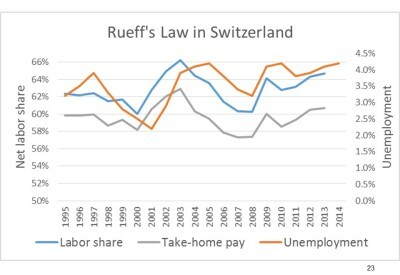 Keynes cited this relationship in his General Theory—which depends on Rueff’s Law, plus the assumption that wage rates are fixed in nominal but not real terms. 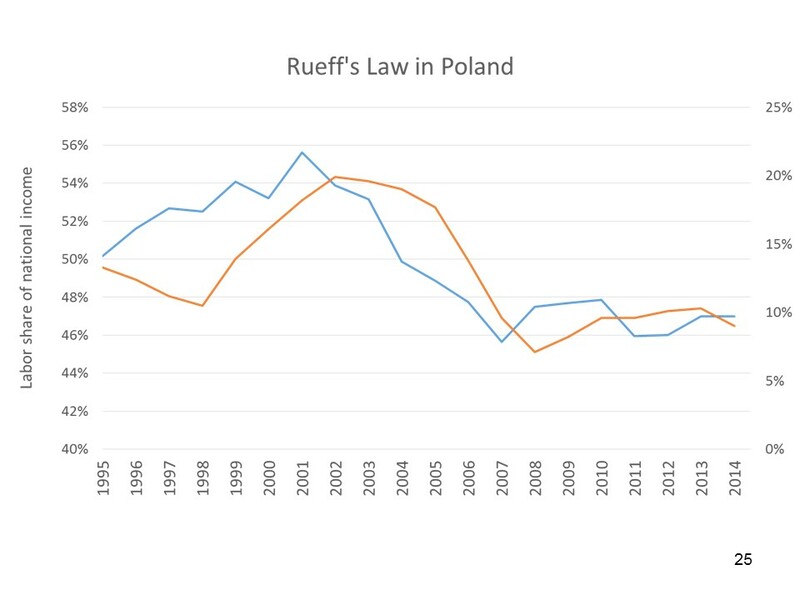 As Rueff noted. “The theory of employment which Keynes calls ‘general’ is valid only for very special cases, for economies which are entirely insensitive to movements of prices and interest rates,” (Rueff 1948). 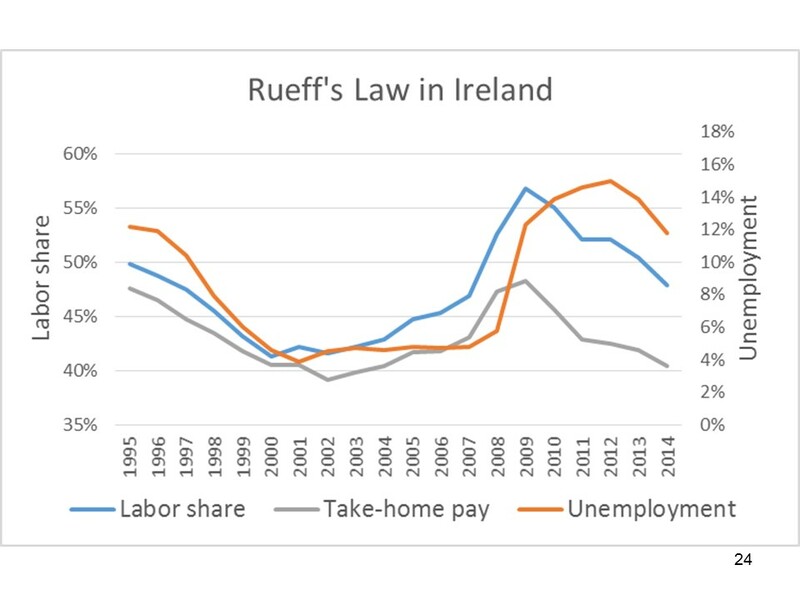 More than 20 years ago, I showed that Rueff’s Law still holds: after adding social benefits and subtracting taxes on workers, there is a near-perfect relationship between the net cost of labor and unemployment in the USA and Britain. That tight relationship has continued both during and since the Great Recession of 2007-09. 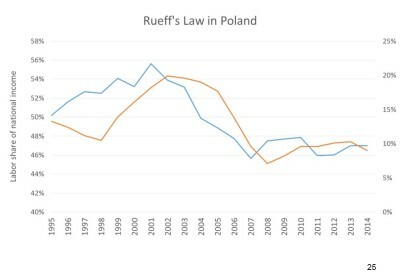 Though I have done far less work on Eastern Europe than the USA, and the available data go back only 15-20 rather than more than 85 years, Rueff’s Law appears to hold as well for Hungary and Poland. 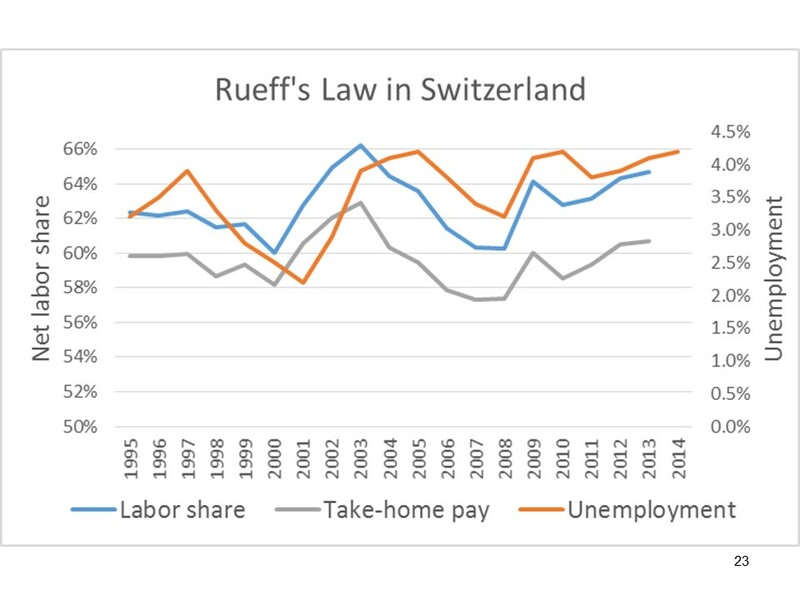 Since, according to Rueff’s Law, the impact of any policy on the unemployment rate is proportional to its effect on labor’s net share of national income, the relationship implies how existing economic policy might be improved. 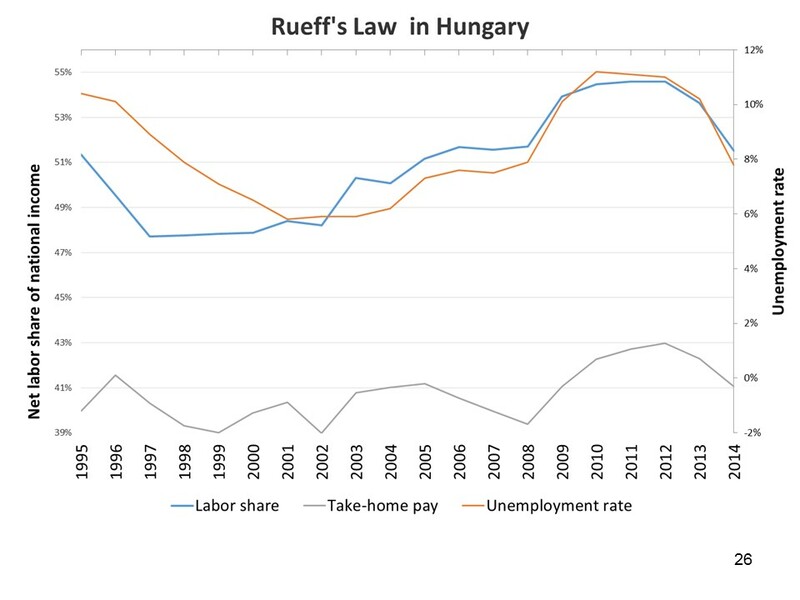 For example, the difference between take-home pay (wages and salaries minus taxes on labor compensation) is cash social benefits (which I have assumed are essentially untaxed) recent reforms of social benefits have almost certainly reduced Hungary’s unemployment rate. But some implications can also seem counter-intuitive. 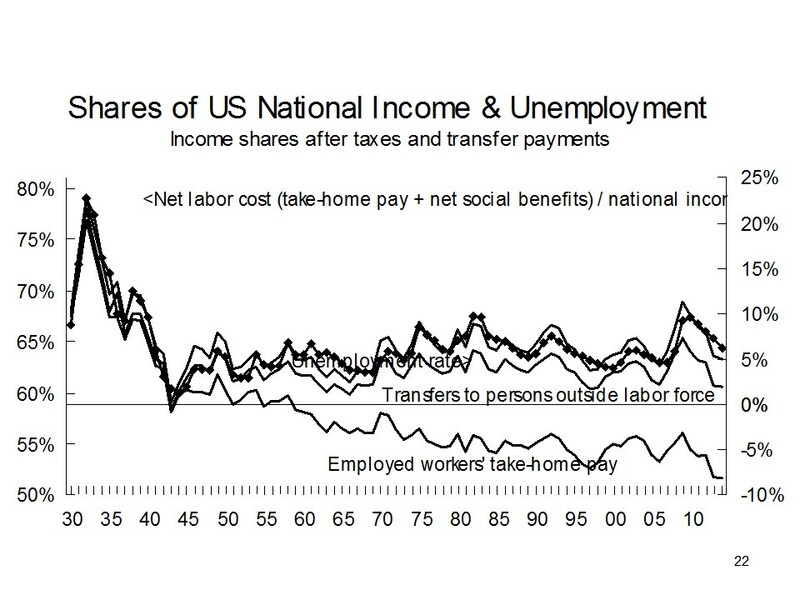 For example, shifting the income tax burden from workers to proprietors might seem to help workers, but it also increases the net labor share of national income, and thus the unemployment rate, which on balance reduces workers’ share of potential national income. 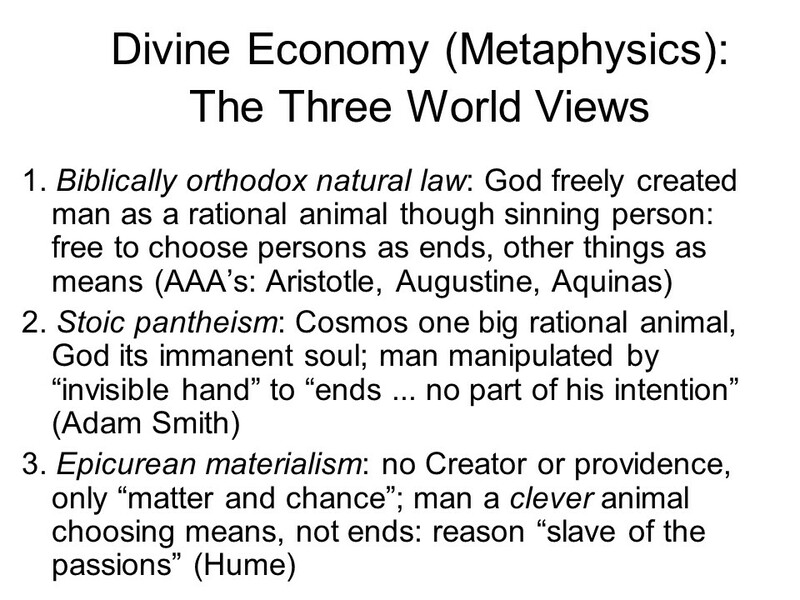 The final chapter concerns “divine economy,” which was Aristotle’s name for metaphysics. 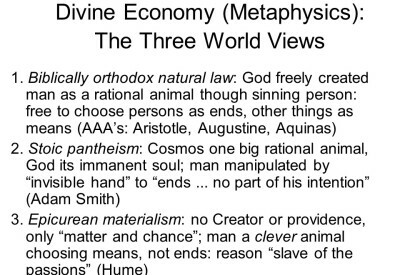 Three alternate world views are presupposed by (Neo-) Scholastic, classical, and neoclassical economics: biblically orthodox natural law, the Stoic and Epicurean philosophies, respectively. Though differing ultimately about immaterial realities–the existence or nature of God or the soul–these three views lead to starkly different behavior among people and starkly different predictions by economists. To understand the relation between scholastic economics and Catholic social thought, it’s helpful to distinguish the history of economics–that is, of the economic theory used by economic thinkers to describe any economic activity–from economic history: how the economic aspect of society develops: for example, the progressive transition of the United States (and in fact most countries) from agriculture to industry to services. Roughly speaking, scholastic economic theory is the analytical toolkit that popes since Leo XIII have used to discuss the new pastoral challenges of economic history as it unfolds. It may seem that encyclicals on economics are abstract, but in fact they are always tied to analysis of some concrete historical event. 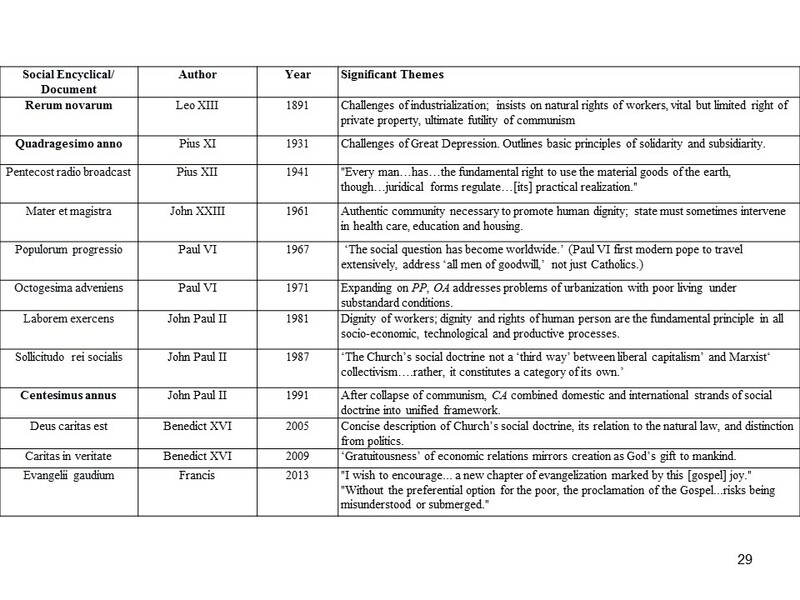 The first encyclical of the Church’s modern social thought, in 1891, was called Rerum Novarum — literally, “of new things — in which Pope Leo XIII dealt with the new social and political challenges raised by industrialization. Forty years later, Pius XI’s Quadragesimo anno (1931) was the first social encyclical to refer to Catholic social thought as a unified doctrine, and the first to describe the basic principles of solidarity and subsidiarity. Pius XII’s 1941 Pentecost radio broadcast marking the 50th anniversary of Rerum novarum was technically not an encyclical. But John XXIII treated it as equivalent to one a decade later in Mater et magistra (1961). Pope John Paul II elaborated and joined these two strains in his three major encyclicals on economic matters, Laborem Exercens, his encyclical on the dignity and vocation of work, and two others that began by looking back at an earlier papal encyclicals, Sollicitudo Rei Socialis and Centesimus Annus, which as the title indicates was issued on the 100th anniversary of Rerum Novarum. Its particular merit is to bring both strains of the Church’s social thought into a single unified framework. Similarly, Benedict XVI’s Caritas in Vertitate (“Charity in Truth”) was originally intended for 2007, the fortieth anniversary of Paul VI’s 1967 encyclical Populorum Progressio, and was notable for emphasizing the “gratuitousness” — the giftedness, if you will– of Creation and even the economy. Deus Caritas Est, drafted under John Paul II and published by Benedict XVI, is valuable for its concise description of the relation among the natural law, Catholic social doctrine, the roles of the Church and secular politics. For reasons I explain in Redeeming Economics, he term “capitalism” has no analytical content whatsoever, apart from Adam Smith’s erroneous “labor theory of value.” Therefore, anyone who uses the term “capitalism,” whether to defend or attack it, condemns himself to an inconclusive pillow-fight in the dark. Pope John Paul II rightly discouraged use of the term in Centesimus annus, 42. The only partial exception I would make is the metaphorical phrase “human capitalism,” to describe the central economic role played by human beings. I would be remiss if I did not mention my friend and colleague David Lutz, who offered me friendly challenges to extend my analysis. 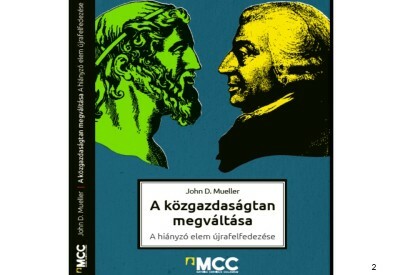 “As a contribution to a revised theory of the business firm,” he wrote, “I propose that we look to the species of Aristotelian justice that Mueller does not mention [in the first edition]”–namely what Aristotle and Aquinas called “general justice.” He goes on to note that the term “general justice” is now commonly called “social justice,” though the latter term is “problematic.” Following Heinrich Pesch, he proposes to rename general or social justice as “contributive justice,”  and borrows a chart from Josef Pieper’s book, The Cardinal Virtues, to illustrate his conception of the relations among distributive justice, commutative justice and general justice. 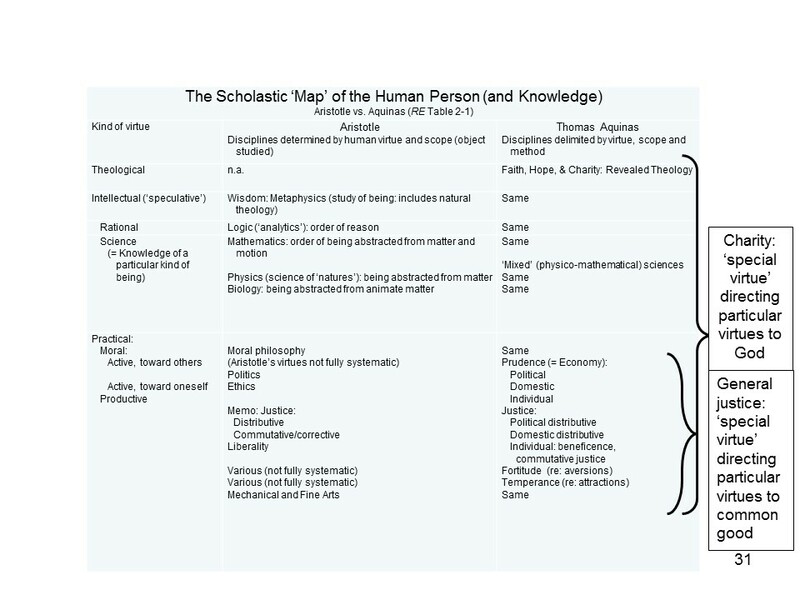 Table 2-1 in Redeeming Economics compares Aristotle’s with Aquinas’s “maps” of human knowledge and of human virtues, listing all the particular virtues. 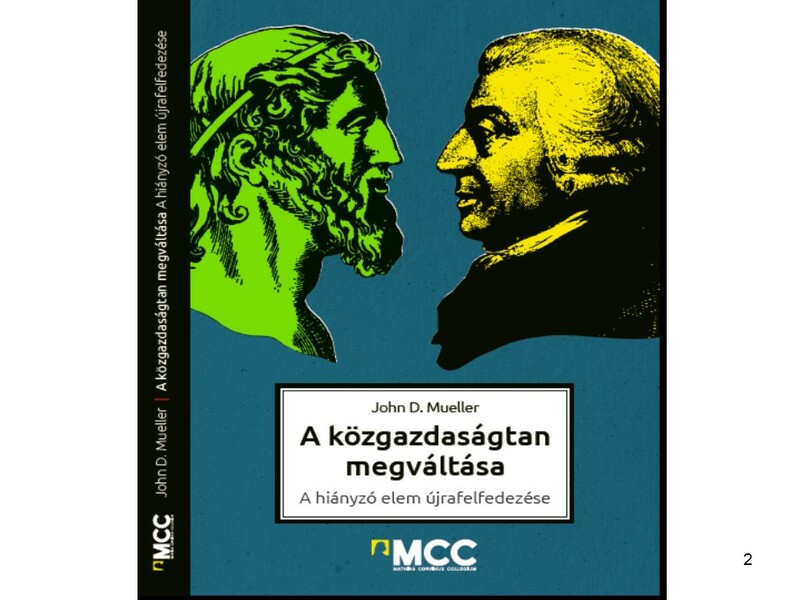 I would like to present that table here, but including “general justice” where it seems to belong (as it appears in the new Hungarian translation.) As Aquinas says, “there must be one supreme virtue essentially distinct from every other virtue, which directs all the virtues to the common good; and this virtue is legal justice.” He notes that corresponding (and superior) to the “special virtue” of general justice, which orders other virtues to the common good, is the “special virtue” of charity, which orders all particular virtues to God. 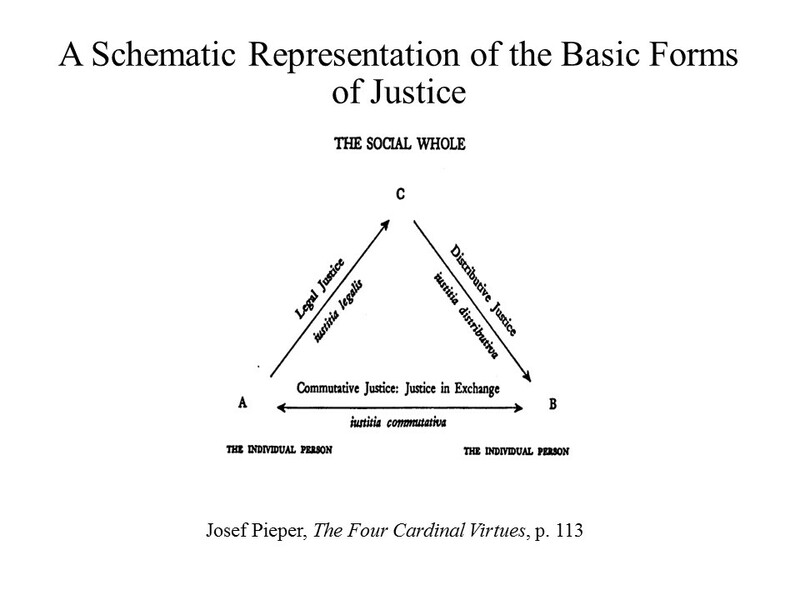 It is characteristic of Pesch and his followers to conflate social or general with distributive justice. As David wrote, this understanding is “problematic,” but he didn’t explain exactly why. Equating social justice with distributive justice is incorrect because distributive justice always refers to common goods. To mistake general or social justice as equivalent to distributive justice, one must therefore falsely presume that all goods are common goods. If we accept the term “social justice” as equivalent to general justice, it must refer to all goods–not just common goods, but also personal gifts, which, as I note in Redeeming Economics, Pesch’s economic theory omitted. Conclusion. I have attempted to cover much ground in 45 minutes. But I hope at least to have explained, first, how the original Scholastic Economics differed from both Adam Smith’s later Classical economic theory and today’s Neo-Classical Economics; second, how an updated version, “Neo-Scholastic Economics,” is reshaping our understanding of secular economic theory and offering new policy solutions, for example, in explaining “demographic winter” and crises like the Great Depression and Great Recession; and finally, how Scholastic Economics provided the analytical “toolkit” which provides the outline for and is necessary to explain the much younger body of Catholic social doctrine. Aquinas, T. (1982 ) On Kingship, to the King of Cyprus. (Tr. Phelan, G.B.) Pontifical Institute of Medieval Studies. Toronto. Aquinas, T. (1993 [1271-72]). Commentary on Aristotle’s Nicomachean Ethics, (Tr.) Litzinger, C.I., O.P., Notre Dame, IN: Dumb Ox Books [1964 Henry Regnery Company]. Aquinas, T. (2007 [1271-72]). Commentary on Aristotle’s Politics, (Tr.) Regan, R.J., Indianapolis and Cambridge: Hackett Publishing. Aristotle (1962 [c. 350 BC]). The Politics, (Tr.) Sinclair, T.A., Baltimore: Penguin Books. Aristotle (1932 [335-322 BC]). The Rhetoric of Aristotle, (Tr.) Cooper, L. New York: Appleton-Century-Crofts. Augustine, A. (395/6). On Free Will, in (Tr. & Ed.) Burleigh, J.H.S (1953), pp. 102-217. Augustine, A. (396/7). On Christian Doctrine. Grand Rapids, MI: Christian Classics Ethereal Library (CCEL). Retrieved on January 9, 2002 from http://www.ccel.org/a/augustine/doctrine/doctrine.html. Augustine, A. (397). To Simplician—On Various Questions, in (Tr. & Ed.) Burleigh, J.H.S. (1953), pp. 370-406. Augustine, A. (401). Of the good of marriage. (Tr.) Cornish, Rev. C.L., From Nicene and Post-Nicene Fathers, First Series, Vol. 3. (Ed.) Schaff, P. (Buffalo, NY: Christian Literature Publishing Co., 1887.) Revised and edited for New Advent by Kevin Knight. Retrieved on February 2, 2005 from http://www.newadvent.org/fathers/1309.htm. Augustine, A. (1984 [413-426/427]). Concerning the City of God Against the Pagans. (Tr.) Bettenson, H., (Ed.) O’Meara, J., New York: Penguin Classics. Becker, G.S. (1974). A Theory of Social Interactions, Journal of Political Economy 82(6), pp. 1063-1091, reprinted in Becker (1991), pp. 253-281. Becker, G.S. (1976). The Economic Approach to Human Behavior, Chicago: University of Chicago Press. Becker, G.S. (1991). A Treatise on the Family, enlarged edition, Cambridge MA: Harvard University Press. Becker, G.S. (1996). Accounting for Tastes, Cambridge, MA: Harvard University Press. (Tr. & Ed.) Burleigh, J.H.S. (1953). Augustine: Earlier Writings, Philadelphia: Westminster Press. (Eds.) Biddle, J.E. and Emmett, R.B. (2013) Mueller’s Redeeming Economics. Research in the History of Economic Thought Research Annual, Vol. 31-A. Bingley, UK. Emerald Group Publishing Limited. Pp. 109-186. Burke, J. (2010) “Distributive Justice and Subsidiarity: The Firm and the State in the Social Order,” Journal of Markets & Morality 13(2), 297-317. Goyette, J. (2013) “On the Transcendence of the Political Common Good,” National Catholic Bioethics Quarterly 13(1). Chafuen, A. (1986). Christians for Freedom: Late Scholastic Economics. Ignatius Press. San Francisco. Chafuen, A. (2003). Faith and Liberty: The Economic Thought of the Late Scholastics. Lexington Books. Donohue, J.J. III and Levitt, S.D. (2001). 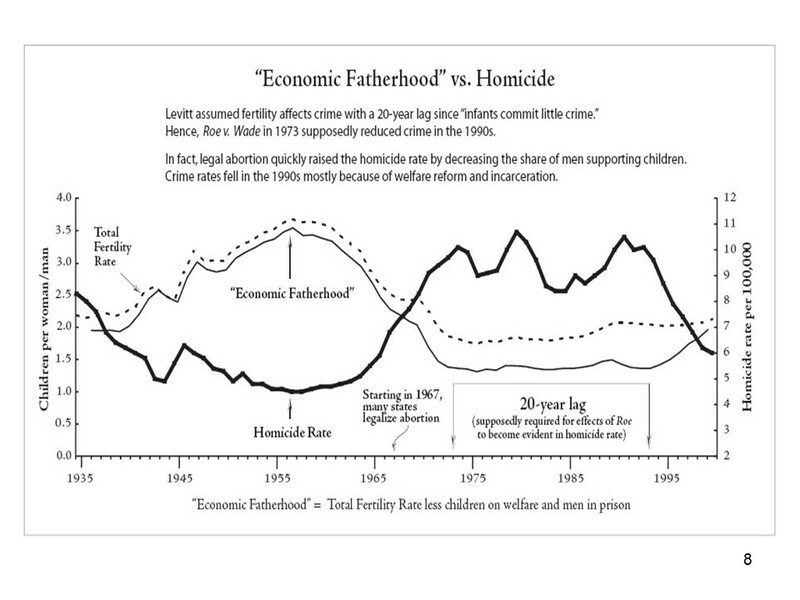 The Impact of Legalized Abortion on Crime, Quarterly Journal of Economics, 116(2: May), pp. 379-420. Rousseau. Journal of Libertarian Studies. Vol. 4 No. 1 (Winter), 45-64. (Ed.) Forte, D. (1998). Natural Law and Contemporary Public Policy, Georgetown University Press, Washington, D.C.
Friedman, M. and Friedman, R. (1979). Free to Choose: A Personal Statement, New York and London: Harcourt Brace Jovanovich. György, L. and Veress, J. (2015). 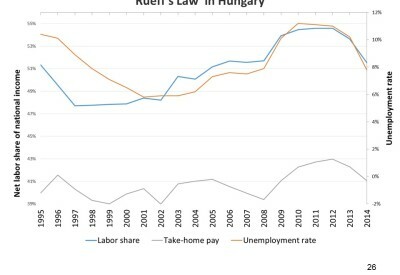 The Hungarian Economic Policy Model After 2010. Budapest University of Technology and Economics. Hamilton, A. (1788). Federalist No. 31. In (Ed.) Carey, G.W. (2001 ). 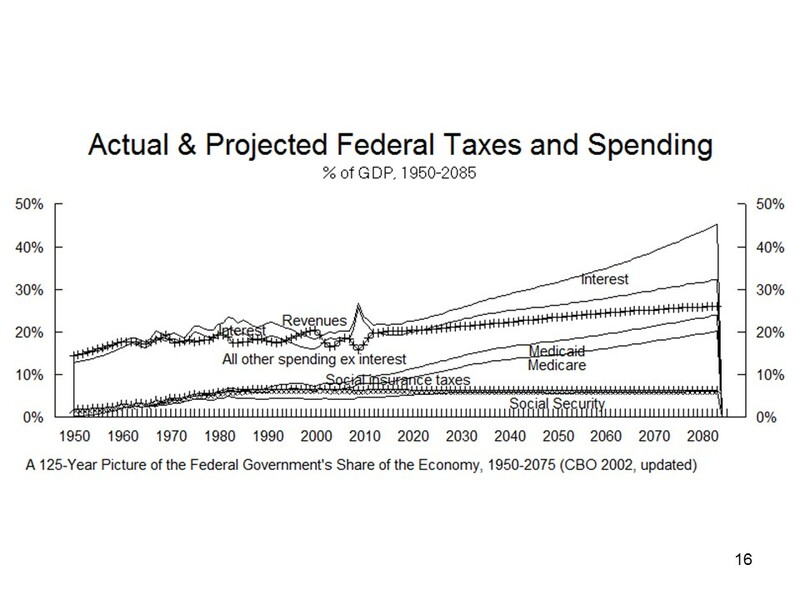 Accessed from http://oll.libertyfund.org/title/788/108619/2274086 on 2009-09-11. Hamilton, A., (1791). Report on Manufactures in 4 Works of Alexander Hamilton, (Ed.) Lodge, H.C., retrieved at http://oll.libertyfund.org/Home3/HTML-voice.php?recordID=0249.04. Hammond, D. J. (2012) Review of Redeeming Economics: Rediscovering the Missing Element. by John D. Mueller. Faith & Economics 59 (Spring) 73-77. Hetherington, N.S. (1983). Isaac Newton’s Influence on Adam Smith’s Natural Laws in Economics. 44 Journal of the History of Ideas 3:495–505 (Jul.-Sep.). Hume, D. (1740). A Treatise of Human Nature. Retrieved on June 30, 2009, from http://www.gutenberg.org/dirs/etext03/trthn10.txt. (Eds.) Hutchinson, W.T. et al. (1962—). The Papers of James Madison. University of Chicago Press, Chicago and London: 1962–77 (vols. 1-10); Charlottesville: University Press of Virginia, 1977- (vols. 11—). Jevons, W.S. (1871). The Theory of Political Economy , London, Macmillan. Keynes, J. M. (1913) Indian Currency and Finance. London: Macmillan. Keynes, J. M. (1936) The General Theory of Employment, Interest, and Money. London: Macmillan. Leeson, R. (1997). The Chicago Counter-Revolution and the Sociology of Economic Knowledge. Working Paper 159, Murdoch, WA, Australia: Economics Department, Murdoch University (July). Leeson, R. (2001). The Eclipse of Keynesianism: The Political Economy of the Chicago Counter-Revolution, New York: Palgrave Macmillan, 2001. Lehrman, L. E. (2012) The True Gold Standard. 2nd ed. Greenville, N.Y.: TLI Books. Levitt, S.D., and Dubner, S.J. (2005). Freakonomics: A Rogue Economist Explores the Hidden Side of Everything, New York: William Morrow (HarperCollins). Lutz, D.W. (2014a) Redeeming Management: The Role of Contributive Justice. Philosophy of Management Conference paper, DePaul University, Chicago, IL. (14-16 July). _________ (2014b). “Poverty and Contributive Justice.” Notre Dame Center for Ethics and Culture Conference paper (October 31). Michael, R. T., and Becker, G.S. (1973). On the New Theory of Consumer Behavior, The Swedish Journal of Economics 75(4), pp. 378-395, reprinted in Becker, G.S. (1976), pp. 131-149. Morse, J.R. (2001). Love and Economics: Why the Laissez-Faire Family Doesn’t Work. Spence Publishing. Dallas. Mueller, J.D. (1998). Taxation, in (Ed.) Forte (1998), pp. 219-279. Mueller, J.D. (2006a). 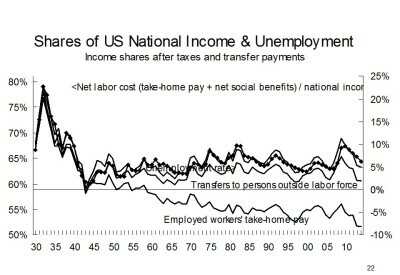 How Does Fiscal Policy Affect the American Worker? Notre Dame Journal of Law, Ethics and Public Policy 20(2), pp. 563-619; Retrieved from http://www.eppc.org/publications/pubID.2671/pub_detail.asp. Mueller, J.D. (2006b). Dismal Science. Claremont Review of Books 6(2), pp. 47-48 (Spring). Retrieved from http://www.eppc.org/publications/pubID.2608/pub_detail.asp. Mueller, J.D. (2008). Infant Industry: The Past and Future of the American System. Lehrman American Studies Center Summer Institute Seminar Paper, pp. 1-35 (June 17). James Madison Program in American Ideals and Institutions and Intercollegiate Studies Institute (ISI). Princeton University, Princeton, N.J. Retrieved from http://www.eppc.org/publications/pubID.3926/pub_detail.asp on 30 October 2009. Mueller, J.D., (2014 ). Redeeming Economics: Rediscovering the Missing Element, Wilmington, DE: ISI Books. Paperback with updated charts and tables 2014. Peters-Fransen, I. (2000). The canon in the history of the Adam Smith problem, in (Eds.) Forget, E.L. & Peart, S. (2000), 168-184. Pieper, J. (1965). The Four Cardinal Virtues: Prudence, Justice, Fortitude, Temperance. Harcourt, Brace & World, Inc. New York. Pufendorf, S. (1991 ). On the Duty of Man and Citizen According to Natural Law, (Tr.) Silverthorne, M. (Ed.) Tully, J. Cambridge, UK: Cambridge University Press. Ratzinger, J. (1998). Milestones: Memoirs 1927-1977. San Francisco. Ignatius Press. Ross, I.S. (1995). The Life of Adam Smith, Oxford: Clarendon Press. Rothschild, E. (1994). Adam Smith and the Invisible Hand. 84 American Economic Review 2: 319-322 (May). Rothschild, E. (2001). Economic Sentiments: Adam Smith, Condorcet, and the Enlightenment. Harvard University Press. Rueff, J. (1932) “The Case for the Gold Standard.” Lecture delivered at L’Ecole des Sciences Politique, March 17. Translated into English and reprinted in Rueff (1964: 30–61). Rueff, J. (1947) “The Fallacies of Lord Keynes’ General Theory.” Quarterly Journal of Economics 63 (5): 343–67. Rueff, J. (1964) The Age of Inflation. Translated by A. H. Meeus and F. G. Clarke. Chicago: Gateway Editions, Henry Regnery Company. Schultz, T.W. (1961). Investment in Human Capital. American Economic Review (March), 1-17. Schumpeter, J. (1954). 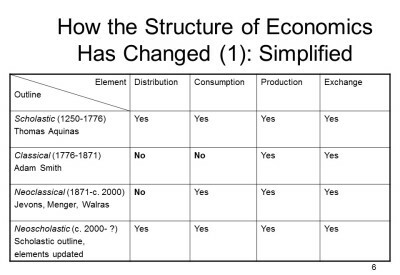 History of Economic Analysis. (Ed.) Schumpeter, E.B., New York: Oxford University Press. Smith, A. (1982 ). The Theory of Moral Sentiments (Eds.) Raphael, D.D. and Macfie, A.L. I Glasgow Edition of the Works and Correspondence of Adam Smith (Indianapolis: Liberty Fund). Retrieved on April 15, 2009 from http://oll.libertyfund.org/title/192. Smith, A. (1985 ). Lectures On Rhetoric and Belles Lettres, ed. J. C. Bryce, 4 Glasgow Edition of the Works and Correspondence of Adam Smith (Indianapolis: Liberty Fund), Accessed from http://oll.libertyfund.org/title/202 on 2009-11-30. Smith, A. (1982 ). Essays on Philosophical Subjects. in (Ed.) Wightman, W. P. D. and Bryce, J. C. Vol. III of the Glasgow Edition of the Works and Correspondence of Adam Smith (Indianapolis: Liberty Fund, 1982). Chapter: SECTION IV: The History of Astronomy, Retrieved on April 15, 2009 from http://oll.libertyfund.org/title/201/56020/916315. Stewart-Robertson, J.C. and Norton, D.F. (1984) Thomas Reid on Adam Smith’s Theory of Morals, Journal of the History of Ideas 45, 314. Stigler, G.J. (1958). Ricardo and the 93 Per Cent Labor Theory of Value. The American Economic Review, Vol. XLVIII (June 1958), reprinted in Stigler 1965, pp. 326-342. Stigler, G.J. (1965). Essays in the History of Economics, Chicago: University of Chicago Press. Stigler, G.J. (1982). The Economist as Preacher and Other Essays, Chicago: University of Chicago. Toma, L. (2014). 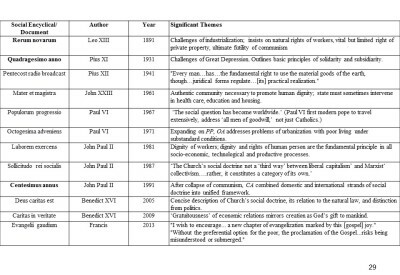 “Proposal for a Catholic Social Teaching Index.” https://www.academia.edu/8230218/Proposal_for_a_Catholic_Social_Teaching_Index. Viner, J. (1972). The Role of Providence in the Social Order: An Essay in Intellectual History. American Philosophical Society, Philadelphia. Viner, J. (1978). 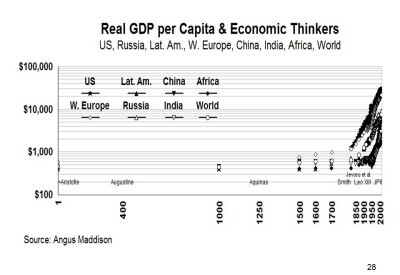 Religious Thought and Economic Society: Four chapters of an unfinished work. (Eds.) Jacques Melitz and Donald Winch. Duke University Press. Durham, NC. Walras, L. (1954 ). Elements of Pure Economics, or the Theory of Social Wealth [Éléments d’économie politique pure, ou théorie de la richesse sociale]. (Tr.) Jaffe, W. Homewood, IL: Richard D. Irwin. Worland, S.T. (1967). Scholasticism and Welfare Economics University of Notre Dame Press. Notre Dame, IN. These opening remarks are adapted from presentations at panels on Redeeming Economics at annual conferences of the History of Economics Society (HES) in 2011 and Association for Private Enterprise Education (APEE) in 2012, published in Biddle and Emmett eds. (2013). In the book I note that I use the term “redeem” in the sense of “fulfill (an earlier promise or pledge).” If, as I believe, the next phase in economics is Neoscholastic, it will have fulfilled its original promise. Deuteronomy 6:5 and Leviticus 19:18; cf. Matthew 22:37-39 and Mark 12:29-31. Augustine’s theory of personal distribution: On Christian Doctrine I,28 (see also On Free Will, cited below); Aristotle’s social distribution (distributive justice): Ethics V,3; Augustine’s theory of utility (consumption): City of God XI,16; Aristotle’s theory of production of people and property: Politics I,4; Aristotle’s justice in exchange (equilibrium): Ethics V,5. 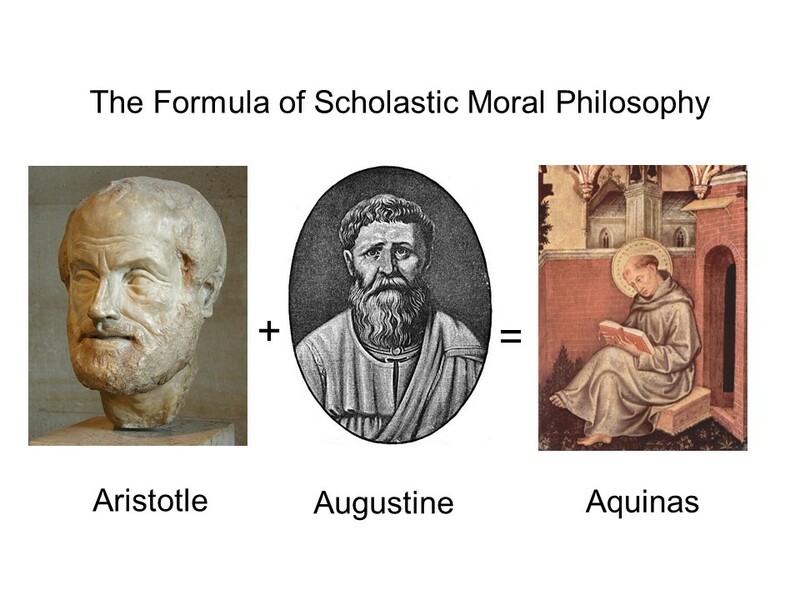 In Aquinas, three of these four elements (the distribution function, the utility function, and the equilibrium conditions) are described (and the production function implied) in Thomas Aquinas, Commentary on Aristotle’s Nicomachean Ethics, translated by C.I. Litzinger, O.P., Foreword by Ralph McInerny, Dumb Ox Books, Notre Dame, IN, 1993; personal distribution: Book V Lectures IV-IX, 293-318; social distribution: 294; the “equilibrium conditions”: 294-296 and 297-299, the “utility function” and analysis of money, 312-315. The production function is described in his commentary on Aristotle’s Politics I, 2: Aquinas, Commentary on Aristotle’s Politics, tr. Richard J. Regan, Hackett Publishing, Indianapolis, 2007, 19-24. The same analysis is also scattered throughout his Summa theologiae, especially in his commentary on the seventh commandment. In the book I typically use the term “final distribution,” to distinguish it from “distribution” as the term has been used since Adam Smith. 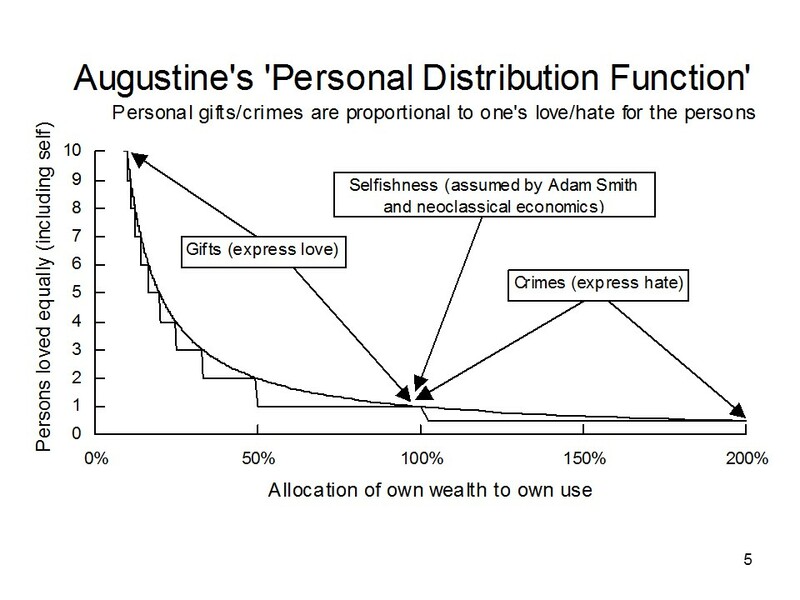 The original scholastic theory of distribution comprises Augustine’s theory of personal distribution–gifts and their opposite, crimes–and in every social community (like a family or political community), what Aristotle called “distributive justice.” Smith conflated what is more properly called “compensation” or “justice in exchange” with distribution properly so called, by introducing the assumption that “every individual … intends only his own gain.” (Smith 1966 , Wealth of Nations, IV.ii.9, accessed on 19 September 2009 from http://www.econlib.org/library/Smith/smWN13.html#IV.2.9. I recount Smith’s oversimplification of the scholastic economic theory he had been taught by his teacher Frances Hutcheson in Mueller 2010 chapter 3. This concise formulation seems to be that of Aquinas, paraphrasing Aristotle’s Physics, ii, 5: Summa 1-II Q1. A2: http://www.newadvent.org/summa/2001.htm; cf. http://classics.mit.edu/Aristotle/physics.2.ii.html. Aristotle (1932 [335-322 B.C. ]), p. 2, p. 4, pp. 102-103. 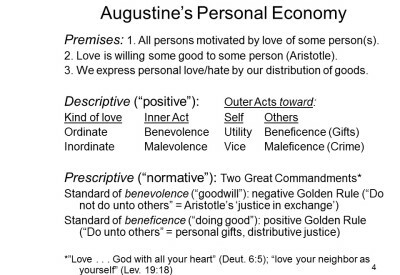 Augustine also introduced the important distinction between “private” goods like bread, which inherently only one person at a time can consume, and “public” goods (like national defense, enforcement of justice, or even this panel) which, at least within certain limits, many people can simultaneously enjoy, because they are not “diminished by being shared” (i.e., scarce) Augustine (395-396), viii, 19, p. 146. Private goods are now sometimes called “rival” goods. The formulation “diminished by being shared” is from Augustine (396/397), I, 2. To be more precise, love with both benevolence and beneficence. Or rather, love only with benevolence but not beneficence. Aristotle 1954 [c. 350 BC], V, v; pp. 117-122. 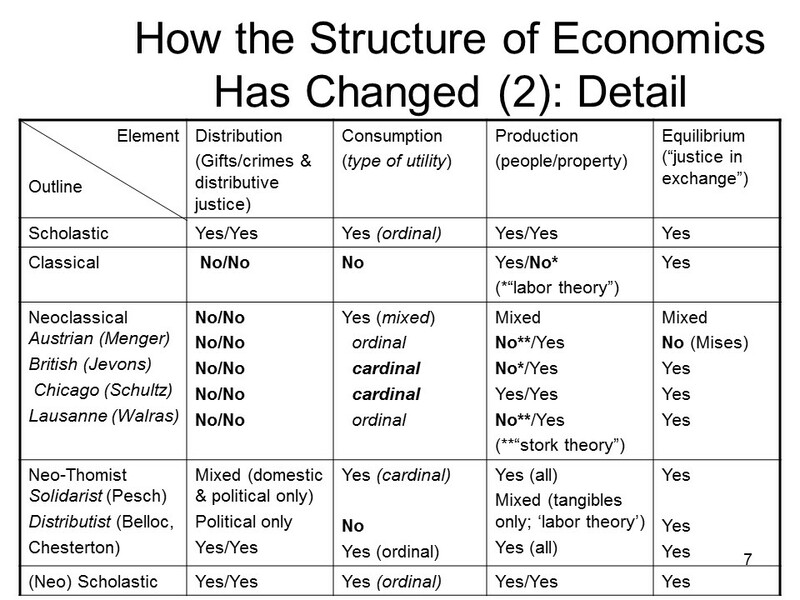 The simplified version merely lists “yes” or “no” to denote the presence or absence of each fundamental element of economics. The three schools of neoclassical economics originated with Jevons 1871, Menger 1976 , and Walras 1954 ). 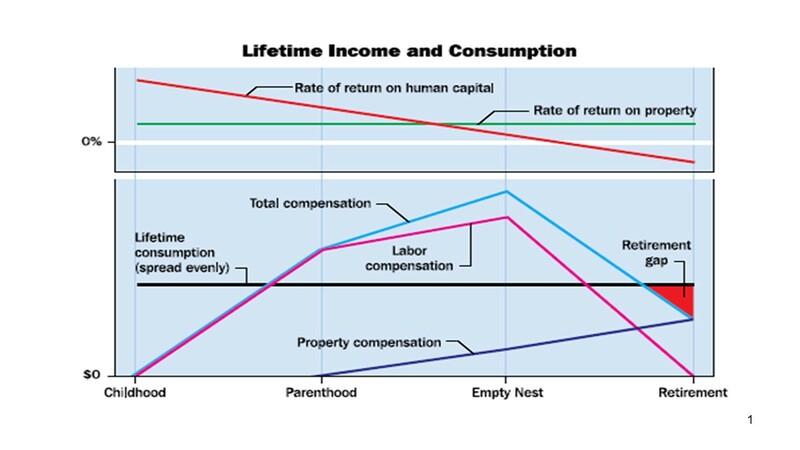 where CKi, and CLi represent the use (“consumption”) by Person i of the services of his or her human capital, Li, and nonhuman capital, Ki; Yi is total compensa­tion (labor and property income) of Person i; Dii is the significance of Person i to himself, and SDij is the significance of all persons to Person i. (6) Ti = Yi – YiDii/dDij. (1a) CKi, + CLi = Yi – Ti. This makes clear that the difference between Person i’s total consumption, CKi + CLi, and total compensation, Yi, is equal to Ti—(net) personal, domestic, and political “transfer payments” from Person i to other persons. Transfer payments comprise any income not received as compensation for contributing to current production. 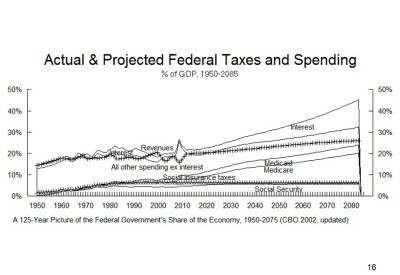 “Net” means that personal gifts made are offset by gifts received, while taxes are treated as transfers paid to the government and balanced against government transfers received. 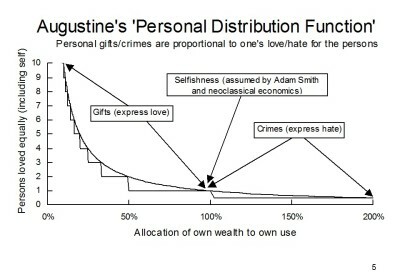 For a purely selfish person, the distributive share Dii/SDij is 100 percent; for a person who makes gifts to others, less than 100 percent; for a criminal, more than 100 percent; and for the victim of crime (or abortion), less than zero percent. where Ui is the ranking by Person i (“utility”) of CKi, and CLi, the units con­sumed in use by Person i of the services of his or her nonhuman goods, Ki, and human capital, Li, respectively. In reality, K and L are not two goods but two classes of goods consumed: (K1, K2, . . . ,Kn) and (L1, L2, . . . ,Ln). Scarcity implies that the value of each unit consumed declines as the number of units increases (dU/dC<0: “declining marginal utility”) and that goods are “used up”—that is, rendered unusable—by consumption (for example, CKi = -DKi). 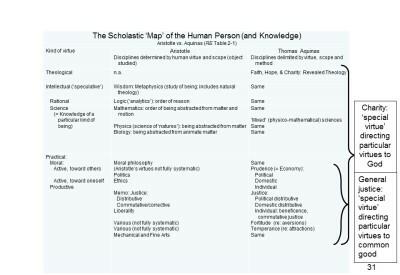 where DKi is the change in the stock (production) of nonhuman goods and dLi the change in the stock of “human capital,” owned by Person i. (1b) CKi +CLi = Yi. For example, I might note my own migration from the Chicago School as of Mueller 1996 to the Neo-Scholastic School in Mueller 2014 . Aquinas, T. (1981 [1265-72]) II-II Q47 A11 contra and corpus, http://www.newadvent.org/summa/3047.htm#article11, and Q50 A3, http://www.newadvent.org/summa/3050.htm. 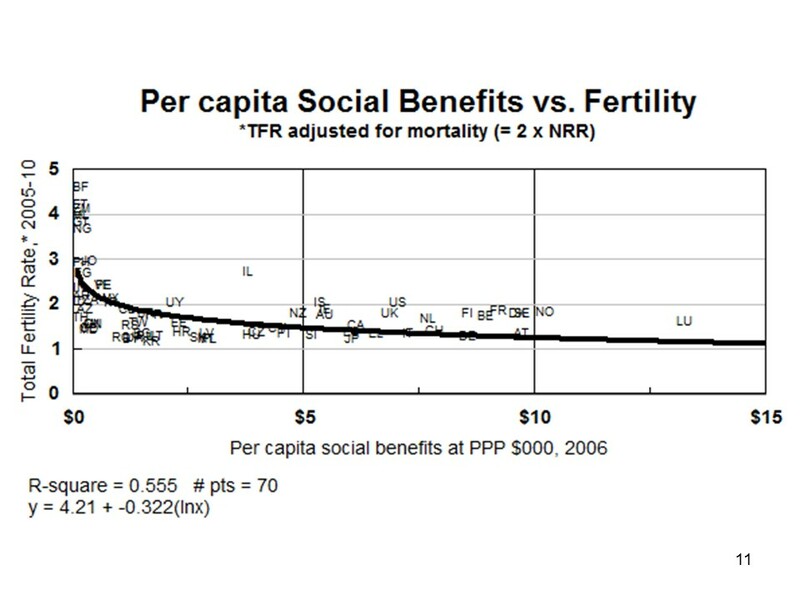 Fertility rates should be adjusted for differences in mortality rates. 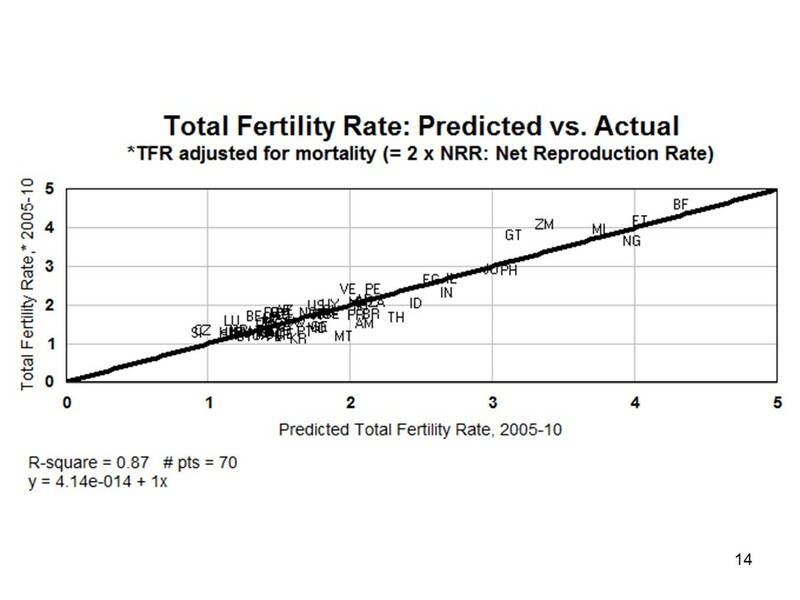 The Net Reproduction Rate (NRR) represents a hypothetical woman whose experience matches the average rates of fertility and death of all women in a given year. 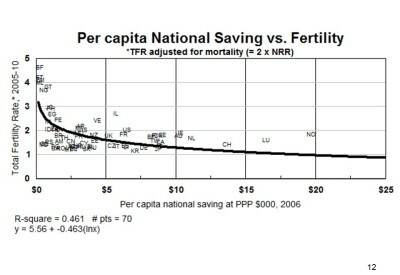 (The Total Fertility Rate measures fertility alone.) An NRR of 1.00 indicates that each woman bears exactly one surviving daughter. 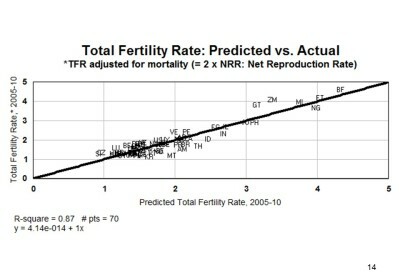 The Total Fertility Rates used in the model equal twice the NRR. For example, the TFR in Mali in 2006 was 7.42, but the NRR was 1.987, which corresponds to a TFR of 3.97 children per couple. In other words, in Mali the typical couple had about 3-1/2 children simply to compensate for the likelihood of premature death before reaching child-bearing age. 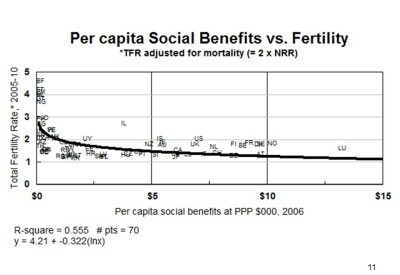 United Nations, Department of Economic and Social Affairs, Population Division, World Population Prospects: The 2008 Revision, New York, 2009; http://data.un.org/Data.aspx?d=PopDiv&f=variableID%3A48. 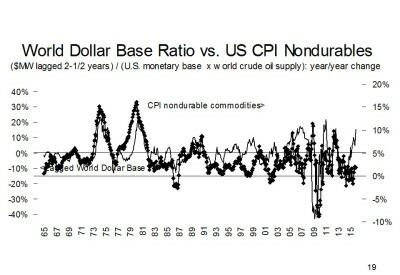 A more complete presentation of the monetary ideas may be found at http://www.thegoldstandardnow.org/key-blogs/207-next-president-end-reserve-currency and http://www.eppc.org/programs/economics/publications/programID.41,pubID.4426/pub_detail.asp. To stay within our time limits, I will not summarize these world views in my oral remarks. But briefly put: In (neo-) scholastic natural law, economics is a theory of rational providence, describing how we “rational,” “matrimonial,” and “political animals” choose both persons as “ends” (which we express by our personal and collective gifts) and the scarce means to be used (consumed) by or for those persons, which we make real through production and exchange. By restoring utility (the choice of means) but not distribution (the choice of persons as ends), neoclassical economics expressed the Epicurean materialism that claims humans somehow evolved as merely clever animals, highly adept at calculating means but having no choice other than self-gratification, since “reason is, and ought only to be, the slave of the passions,” as Hume put it. George Weigel, Evangelical Catholicism: Deep Reform in the 21st-Century Church, Basic Books, 2013. While affirming the right of private property, and predicting the failure of communism, he insisted on the dignity and rights of workers and the need to protect the weakest, by government intervention if necessary. SRS was published on the 20th anniversary of Populorum Progressio, and was intended to fill “the need for a fuller and more nuanced concept of development” than had previously been put forward. In it, he argued that the terms “poverty” and “development” mean poverty or development of the whole person, not just the economic or political system. In it, the pope looked back at what remains valid in the social thought begun in that encyclical, but also took note of the “new things” which had emerged, such as changes in the nature of Western economies and the collapse of communism. György, L. and Veress, J. (2015). Op. cit. “42. Returning now to the initial question: can it perhaps be said that, after the failure of Communism, capitalism is the victorious social system, and that capitalism should be the goal of the countries now making efforts to rebuild their economy and society? Is this the model which ought to be proposed to the countries of the Third World which are searching for the path to true economic and civil progress? David Lutz gives a pretty thorough precis of my recounting of the history of economics, from its scholastic beginnings when Thomas Aquinas’s integrated elements from Aristotle and Augustine of Hippo, Adam Smith’s radical over-simplification, the reinvention and updating of Augustine’s theory of utility starting in the 1870s, and finally, my claim that we have already entered the next “neo-scholastic” phase. David’s point of entry is working out a neo-scholastic theory of business management[, about which he correctly says I wrote relatively little, beyond reclaiming Aquinas’s threefold division of moral philosophy into personal, domestic and political prudence or “economy,” and noting that the modern business firm and non-profit organization are both offshoots of the ancient household: the modern household specializes in producing and maintaining people, while the modern business firm specializes in producing and maintaining productive property, and the modern non-profit specializes in distributing gifts beyond the household. Aquinas, T. (1981 [1265-72]), S.T. II-II Q58 corpus, available at http://www.ccel.org/a/aquinas/summa/SS/SS058.html#SSQ58A6THEP1. Aquinas concludes the passage: “It follows therefore that the good of any virtue, whether it orders a man toward his very self, or orders him toward some other individual persons, is referable to the common good, to which justice is ordered. And according to this the acts of every virtue can belong to justice insofar as it orders a man toward the common good. It is in this sense that justice is called ‘general virtue.’ And since it belongs to law to order to the common good, as stated above, whence it is that such justice, said in a way to be ‘general,’ is called ‘legal justice,’ because through it a man harmonizes with the law ordering the acts of all the virtues to the common good.” John Goyette, whom David Lutz also cites, paraphrases Aquinas (I think pretty accurately) as follows: “The virtue of legal justice aims at the good of the whole political community and thereby serves all those who participate in that whole. Because it orders or directs all the other moral virtues, legal justice is called ‘general virtue’ (virtus generalis), and the actions of all the other virtues are said to belong to justice, to become in some sense acts of justice. While the virtue of particular justice is limited or restricted to certain kinds of actions, ‘general justice’ pertains to the full range of human actions by ordering the actions of all the other virtues to the common good.” Goyette (2013), p. 148. My omission of general justice from Redeeming Economics was probably related to my deformation professionelle of being an economic and financial market forecaster: As I suggest below, while particular virtues like justice in exchange and distributive justice can be unambiguously quantified, the “special virtues” of general justice and charity apparently cannot. S.T. II-II Q58 ad4, available at http://www.ccel.org/a/aquinas/summa/SS/SS058.html#SSQ58A6THEP1. This suggests that general or social justice may not be unambiguously quantifiable. Yet there may be great heuristic value in attempts to do so, for example Luigi Toma’s effort to devise a “Catholic Social Thought Index (CSTI) in Toma 2014. III Q23 A4: http://www.newadvent.org/summa/3023.htm#article4. 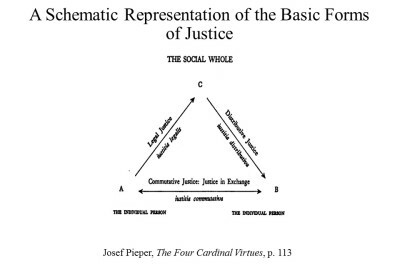 To place general justice and charity in proper perspective, it is helpful to quote the final two sentences in The Four Cardinal Virtues which immediately precede the chart that David Lutz uses to illustrate his argument about general justice: “For it is true, as Thomas says, that ‘mercy without justice is the mother of dissolution’; but also that ‘justice without mercy is cruelty.’ Now it becomes possible to state the inner limits of justice: ‘To be willing to watch over peace and harmony among men through the commandments of justice is not enough when charity has not taken firm root among them. '” Pieper 1965, 112-113. “The term social justice is today generally used as a synonym of what used to be called distributive justice.”Burke (2010), p. 297, cited in Lutz 2014a.